Hundreds of barriers in streams still create bottlenecks throughout Oregon's coastal watersheds, creating major problems for fish and people. Most are problem culverts at road crossings that contribute to flooding and road damage, along with some small dams and tidegates. Collectively, these barriers can also prevent the full benefit of decades of habitat restoration and other conservation investments from being realized. Minimizing these impacts across a major landscape will come with significant, lasting benefit to fish and people, now and into the future. Salmon, steelhead and other ocean-going fish need to access a wide range of different types of habitat throughout their freshwater life cycle to survive. Fish people call this " habitat connectivity." Big, adult fish need to be able to travel from the ocean to reach spawning grounds in rivers and small streams, and juvenile fish need to access different habitat types to feed, mature and escape predators, storms and other dangers before eventually migrating out to sea. Traditionally and by necessity, much of the work to restore access for salmon and steelhead with diverse types of habitat they need has been tackled on a project-by-project basis, as opportunity and funding comes together. This approach has led to a tremendous amount of critical habitat work getting done over decades, nowhere more than on the North Oregon Coast. What is still needed to maximize the fruit of all that labor is a comprehensive strategy linking all those projects and their benefits together, and to remove bottlenecks that are preventing full realization of the conservation benefits for entire populations of fish throughout a broad landscape. The Salmon SuperHwy Project provides that strategy. 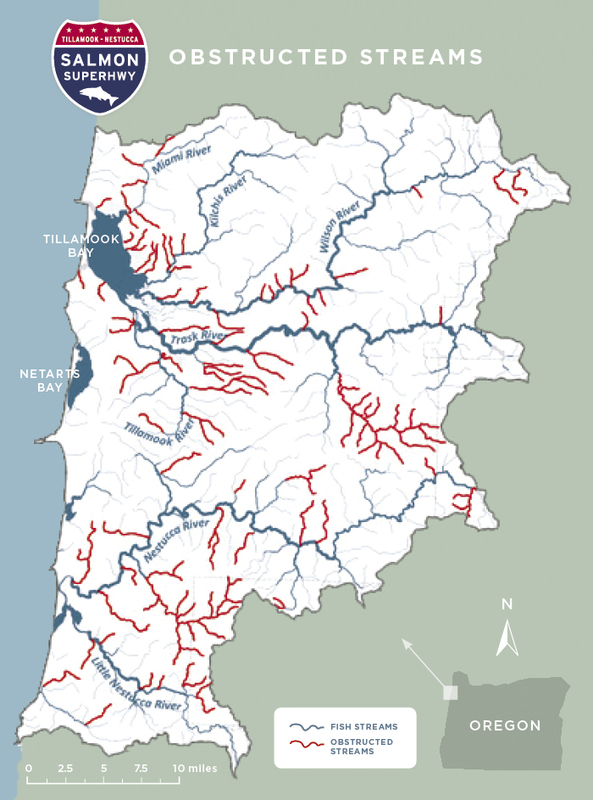 The six adjacent major river systems that drain from the Coast Range into Tillamook and Nestucca bays on Oregon's iconic North Coast provide an historic opportunity to reconnect productive habitat with six species of anadromous (ocean-going) fish at levels and at a scale not seen in decades. Maximized connectivity of fish habitat at an unprecedented scale and optimized conservation return on investment is the goal, and The Salmon SuperHwy Project spanning the 940-square mile Tillamook and Nestucca landscape on Oregon's iconic North Coast is the strategy to get there - together.